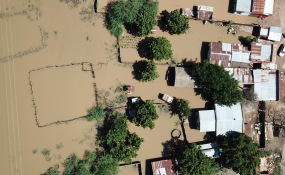 Aerial view of Tengani, Nsanje, Malawi, affected by floods due to the incessant rains from March 5 to March 9 2019. Severe floods in Malawi have affected about a million people and claimed 56 lives. This isn't uncommon in the country. Between 1946 and 2013, floods accounted for 48% of major disasters, and their frequency and severity is increasing. They have occurred in 16 out of the country's 28 districts, in both rural and urban areas. The Lower Shire Valley in southern Malawi, bordering Mozambique, composed of Chikwawa and Nsanje Districts is the most flood prone and affected area. Floods stifle development efforts at every level. They affect many sectors from agriculture to sanitation, environment and education. The combined effects of floods and droughts cause losses of at least 1.7% of Malawi's GDP annually. And due to food shortages and higher domestic prices, the national poverty headcount rate increases by almost 1% each year. One of the major reasons for floods in Malawi is rainfall characteristics. Rainfall is variable, erratic and rainfall in the highlands often causes floods in the low-lying areas. Also, extensive deforestation increases runoff and the overall flood risk. But to understand how floods become a "disaster" we need to understand why local communities are so vulnerable in the first place. Floods, similar to other hazards, are often portrayed as "natural disasters" when their impact actually has a large amount to do with social and human vulnerability. As Phil O'Keefe, Ken Westgate and Ben Wisner - prominent scholars who shaped current academic thinking on the topic - have argued, the impact of disasters like floods is a consequence of social and economic factors. For instance, high poverty levels mean people lack access to land and work and they are often driven to settle in zones that are more exposed to natural hazards. What this suggests is that the most effective approach to managing the effects of floods is to deal with the underlying causes of vulnerability. This should include addressing particular issues that make certain community groups more vulnerable than others. Because the threat of floods can't be eliminated, the best strategy is one that improves the overall development of local communities. In my research I investigated community-based flood-risk strategies, which are widely used in Malawi. My findings showed that although strategies are mostly responsive and focus on relief, more are starting to look at how to mitigate and prepare for floods. But a number of challenges remain. There's not enough funding, community participation is limited, while the existing decentralised governance system isn't effective so project planning, implementation and maintenance isn't smooth. Projects are also unsustainable, rely heavily on aid and there's a lack of ownership by the community which undermines the impact. Malawi is the third poorest country in the world. About half the population lives below the poverty line. Chikwawa and Nsanje, which have been particularly affected by the floods, are the poorest in the country. Over 80% of Malawians rely on agriculture. Most are smallholder farmers. With their livelihoods reliant on a single rain-fed season they are particularly vulnerable to floods. Recent research shows that smallholder farmers lose 2.67% of their agricultural produce to flooding each year. High levels of poverty, a lack of access to land and a growing population means people have smaller pieces of land for farming. This has led to settlements in marginalised areas that are prone to flooding. Another factor contributing to people's vulnerability is that housing and infrastructure are of poor quality. In addition, there's a lack of economic diversification, employment opportunities and access to social services. This means that people are limited in how they can prepare for a possible flood and bounce back after it's happened. To address the flood disasters the Malawian government signed a comprehensive national disaster risk policy in 2015. But delivery has been mixed.. This is mainly because of a lack of designated funding and a number of challenges in the existing governance approaches. The government has pushed for resettlement of people living in flood prone areas. But planning is ineffective and giving people land with no other support can expose them to further risks. Flood risk management is mostly delivered by NGOs who implement community-based approaches like early warning systems, search and rescue training, village contingency planning, and the establishment of group savings schemes. There have also been attempts to create a state-of-the-art national early warning system, based on the latest computer modelling and satellite products. Its effectiveness hasn't been evaluated yet. Despite these efforts the gaps in managing the risk of floods are significant. A network of rain gauges as well as timely weather and climate information are essential components for early warning systems and planning. But both need to be improved. In addition, there's not enough uptake by local communities of early warning information. And on top of it all there's barely any flood protection infrastructure - like robust dikes. What does exist is of poor quality. One of the biggest problems is that there's only limited involvement of local communities. This has led to projects not being implemented in all affected areas. And often projects reflect the donor's agenda rather than needs on the ground. To manage flood risks more effectively Malawi needs to take some crucial steps. The first is that short-term priorities must be identified and coupled with a comprehensive long-term adaptive plan. This should also take into account the possible effects of climate change. It must provide a fine balance between physical infrastructure and improved forecasting and warning systems, among other strategies. And more comprehensive risk assessments should make use of new technologies - like remote sensing and crowd-sourcing. This must be accompanied by a well-planned financial agenda. Finally, any proposed solutions must be designed with the involvement of those most affected because they are the custodians of rich local knowledge and can provide valuable insights.